In Australia we welcome in the New Year on January 1st with fireworks, parties and new year resolutions. The most spectacular pyrotechnic display is on Sydney Harbor, where a combination of fire and water holds people in awe and wonder. In many other cultures the New Year is celebrated at a different time of year. While I’d like to wish everyone a Happy New Year based on the Gregorian calendar, of particular interest in this post are the Tibetan astrological and astronomical systems that are intimately connected to the elements. 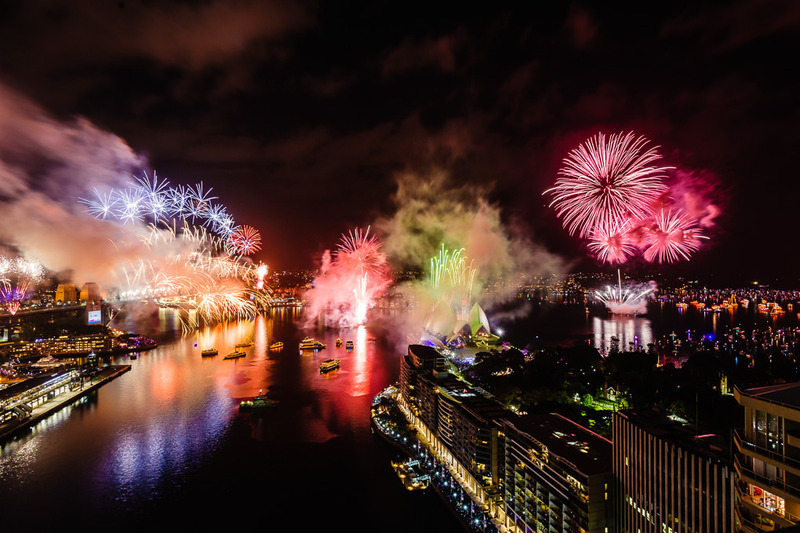 Sydney, Australia sees in the 2015 New Year with a spectacular display of fire(works) and water. Source: sydneynewyearseve.com. The Elemental New Year falls around December and is based on the lunar system. Each of these systems have their own purposes, so it is advised to treat them separately. While the Tibetan calendar defines the official time calculation for the New Year, the systems of the Kalachakra New Year and the Elemental New Year are considered essential for astrological calculations. As I understand it, different Tibetan groups may use these different systems differently. 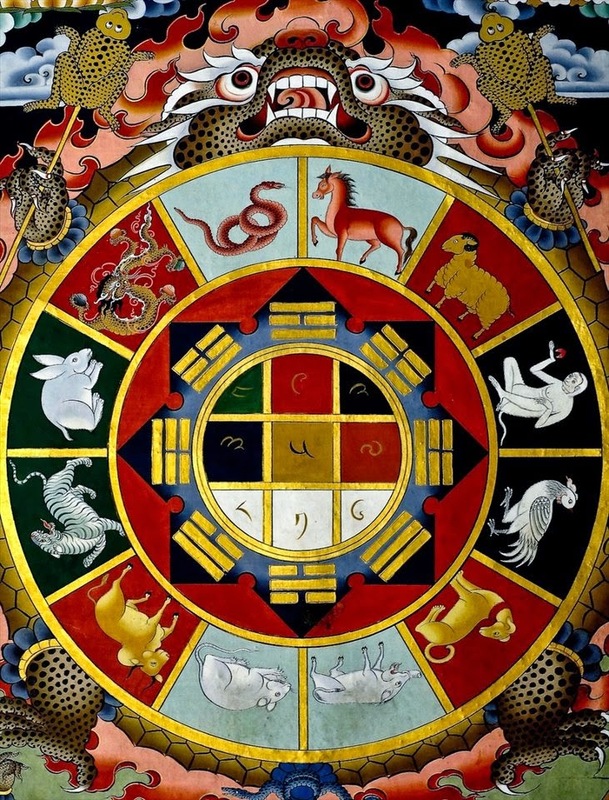 Tibetan astrology and astronomy draws on the Chinese (fire, water, earth, metal and wood) and Indian systems of the elements (fire, water, earth, wind and space). The teachings of the Bon religion and Buddhism are also part of the mix. This combination of approaches makes the Tibetan calendric system unique, and very complicated. The syncretic approach reminds me of Japan where both Wu Xing (Chinese) and the Buddhist approach to the elements have been adopted and adapted to the native belief systems. The oldest system of astrological calculation in Tibet, Byung rtis, is referred to as Elemental astrology. It describes various patterns of events and activities within an hour, day, month, year or multi-year period. These patterns are described using twelve animal signs and five elemental signs drawing on systems of Chinese origin. For those interested in reading about the elements and the Chinese Zodiac, I have written about them here. 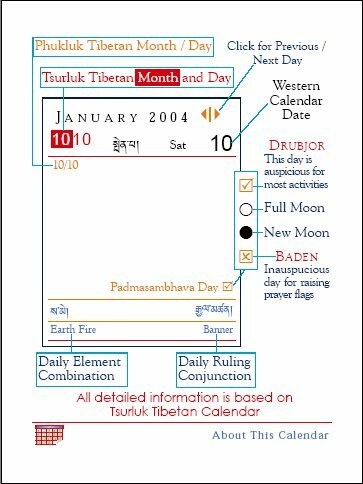 A Tibetan astrological (Elemental) calendar based on the Bon tradition and Chinese influences. Source: http://www.tactus.dk. In contrast to China, each element in the Tibetan calendar is associated with two consecutive years, first in its male aspect, then in its female aspect. An animal sign will rule for only one year at a time. For example, a male Earth-Dragon year is followed by a female Earth-Snake year. A well-known expression of this system is as an elemental and animal sign for the year. The Gregorian year of 2015 is a female Wood-Sheep year in the Tibetan astrological calendar. The sixty possible combinations of animal and element provide names for each year of a Tibetan sixty-year cycle. Animal and elemental signs are also applied to different cycles of time ranging from an individual hour to an entire year. As found in India, the fingers and thumb of each hand is associated with an element. The study of astronomy/cosmology in Tibet, Skar rtsis, is considered to derive from the teachings of the Kalachakra tantra. These teachings spread from India to Tibet in the early 11th century, with it’s importance waxing and waning since then. The Kalachakra system connects the movements of heavenly bodies, such as the cycles of the sun and moon, with the activities of an individual person. The primary means in Tibet for determining the auspiciousness of the day for certain types of events is to calculate the combination of elements that govern the day. There are four elements (water, earth, fire and wind) in the Skar rtsis calculation system. Each celestial location determined by the lunar orbit is associated with a particular element. Further, each planet is associated with an element. The element of the planet when combined with the element of the lunar constellation result in ten possible element combinations, which provide a guide to the energy of day. An example of a daily Tibetan calendar showing the auspiciousness of the elemental combination. Source: nitartha.org. The combination of earth with earth is an example of one of the elemental combinations that is considered very auspicious. The energy of this day is said to favor the accomplishment of one’s wishes, and is favorable to begin construction projects. In contrast, the combination of fire and water is considered very unfavourable. Any activity on this day can face significant obstacles that may weaken one’s vitality. The importance placed on these combinations of elements highlights their significance to Tibetan culture. Finally we get to the Elemental New Year! This is used in the calculation of an Elemental horoscope to define a person’s age in Tibet. The Elemental year a person is born is considered to be year one and so a person is one year old from the day of his/her birth. In the next Elemental New Year everyone becomes one year older. This can lead to some complicated situations, as you can imagine. The Elemental New Year changes on the 1st day of the new moon of the 11th lunar month. At this time it is believed that all astrological spirits change and their nature becomes dual. This takes place in December around the Winter Solstice in the Northern Hemisphere when the Sun has the shortest day. It is another example of the relationship between the solstice and the elements. After the solstice the Sun changes direction northward, and in the same way changes the position of astrological influences. 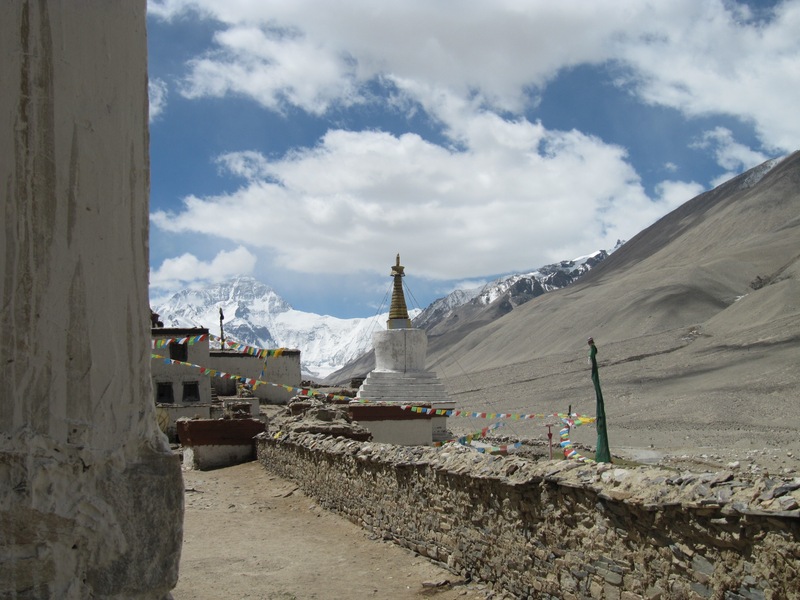 This Monastery, close to Mt Everest, gives a sense of the power and influence of the elements in the lives of Tibetans. The Tibetan system of astronomy and astrology and related calendars is extremely complex. It is reported to take five years to study and master. Not surprisingly, only a small portion of this complexity is reflected in this post. Even though it is only scratching the surface, and could need some fine-tuning, there is no doubt that the elements are fundamentally important to Tibetan astrology, astronomy and the timing of the New Year. In turn, they have influenced the lives of Tibetans for hundreds of years and more. This entry was posted in Aether/Space, Air, Australia, China, Earth, Fire, India, Spirit, The five elements, Water, Wood, Zodiac and tagged Air, Astrology, Buddhism, China, earth, Fire, India, Japan, the elements, Tibet, Water, Wu Xing. Bookmark the permalink. Thanks Mike, I’m pleased that you liked it. As with many topics related to the elements, the more you explore the more there is to the story. I was hoping that this post would provide a sense of the complex astrology and astronomy found in Tibet. It certainly made me see their culture in a different light. People can delve deeper into the details if they want to learn more.